Flappy Bird Creator Pulled Game Because it Was "Too Addictive"
Dong Nguyen says he took down Flappy Bird because it had become an "addictive product." In an exclusive interview with Forbes magazine, Flappy Bird creator Dong Nguyen offered some much-needed elaboration on why he suddenly removed his game from stores. People figured it was either Nintendo's meddling or the game's harsh critical reception that made him pull the plug, but Nguyen insists his reasoning was altruistic. "Flappy Bird was designed to play in a few minutes when you are relaxed," said Nguyen "But it happened to become an addictive product. I think it has become a problem. 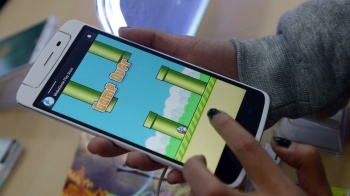 To solve that problem, it's best to take down Flappy Bird. It's gone forever." Nguyen explained that it was guilt, as well as the disruption to his comfortable, normal life (for example, Nguyen was late to the Forbes interview on account of a meeting with the Vietnamese Prime Minister), that motivated him. "I couldn't sleep," he said, of the weeks following Flappy Bird's surprise rise to fame. He said that his conscious has now been relieved, and he has spent the past few days, Internet-free, catching up on slumber. "I don't think it's a mistake," he said. "I have thought it through." Nguyen declined to confirm the rumor that his app was earning $50,000 per day at it's peak, admitting, "I don't know the exact figure, but I do know it's a lot." Finally, Nguyen said that the game's resemblance to Nintendo's Super Mario Bros. was purely coincidental, and again stressed that he had not faced any kind of legal threat from the Japanese company. Well, I didn't really know what Flappy Bird was a week ago, and now I've written two articles about it. One thing is for sure, people take smartphone games seriously these days.